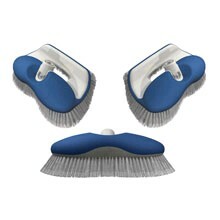 The Hammerhead is the only marine brush specifically developed for use by hand or with a handle. Ergonomically designed, the Hammerhead has a soft, contoured body that is comfortable and easy to grip when hand washing. The brush also fits onto all Shurhold handles. With its innovative, bi-level design, the Hammerhead is the one perfect tool for two crucial cleaning tasks. A boater can push the brush out in front horizontally like a deck brush and clean vertical hull surfaces just as effectively. Over 300 soft tufts  double the amount on most brushes  work to get rid of dirt, grime and salt without damaging the finish. A sleek integrated safety bumper provides protection from any angle. Shurhold code 2110. Shurhold s exclusive SHUR-LOCK quick release system locks any Shurhold handle quickly and easily with all Shurhold accessories.